I was so ready to love this new take on The Twilight Zone. As someone with zero interest in Star Trek: Discovery, this reboot was the hook CBS All Access needed to pull me in: a modern update of Rod Serling's classic anthology series, with the promise of more thought-provoking parables and what-if scenarios we'd hope to never face in the real world. It even features Academy Award-winner Jordan Peele standing in for Serling as the host, and is being made in part by Peele's Monkeypaw Productions company - what could go wrong? Now, three weeks and three episodes later, I'm throwing in the towel. With the exception of star power, this iteration of The Twilight Zone seems to lack everything that makes the original series so timeless. And wouldn't you know it: The majority of those classics are ready and waiting for you on Netflix. Perhaps it's premature to bail after watching so few episodes, but the experience has been a chore - and frankly, I could spend that time filling the gaps in my knowledge of the original show. This is by no means a formal review, more my own PSA to anyone who cares to listen - but when seemingly everyone and their mother has access to a Netflix account, you really shouldn't subscribe to CBS All Access just to give this new Twilight Zone a look. This is actually the fourth version of The Twilight Zone, which debuted on CBS way back in 1959. Its impact on media at large feels immeasurable, with Rod Serling and co. serving up all kinds of stories, from sci-fi to slice-of-life, heartwarming to horrifying. The more iconic episodes have become cornerstones of the zeitgeist for anyone who remembers a time before smartphones; as a kid, I was always eager to stay up late and give myself nightmares watching the annual New Year's Twilight Zone marathon on the Syfy channel. Since the original run of five seasons ended in 1964, CBS has attempted three reboots, and it seems like the 2019 version is the frontrunner in terms of initial hype and fanfare. For instance, I was completely unaware of the 2002 version, hosted by none other than Forest Whitaker and featuring a hilariously of-its-time nu-metal opening. So how does this new series get The Twilight Zone's tone so wrong? In my mind, it all comes down to a lack of authorship and singular vision, which can never be overcome when trying to reboot someone else's best-known work. Rod Serling didn't just create The Twilight Zone then show up to read his lines; he's responsible for over half of all the stories, scripts, and teleplays, perfectly setting the tone for the series in both his writing and his performance as our tour guide/narrator. Serling's oversight and creative control over every facet of production is the glue holding the show together, and The Twilight Zone feels like his personally curated presentation to the viewer. Similarly, Black Mirror creator Charlie Brooker has carefully constructed and guided his show, while Tim Miller handpicked the stories for his nihilistic Netflix series Love, Death + Robots. In comparison, it's as though Peele swooped in from the seat of executive producer to do his narrator scenes before leaving for another one of his many major projects. I wouldn't be surprised if none of these new Twilight Zone episodes have Peele credited as the sole writer, as I suspect he's saving his best stuff for feature-length films. And why shouldn't he? Get Out is an absolute masterpiece, and though I'm too chicken to watch Us in theaters right now where I can't control the volume, everything about its creepy doppelganger vacation looks phenomenal. 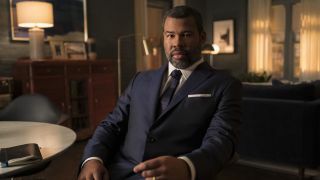 But without Peele's personal stamp on these episodes, his monotone narration lacks the oomph of someone excitedly inviting you to take a look at their latest triumph. Peele's deadpan delivery just feels so flat compared to Serling's rhythmic, inviting voice and intellectually impish smile. It's not Peele's fault that this new Twilight Zone isn't cutting it. No matter how many times CBS tries to revive The Twilight Zone, the show can never step out from Serling's shadow, and his absence will always be felt in any new episode. The Twilight Zone's legacy isn't just its memorable reveals and spooky circumstances - it's the way each episode was meant to teach us something about human nature, and society's tendency to get in its own way. Serling's selection of stories are powered by snappy writing, charismatic acting, and sharp cinematography, each episode like a universal lesson Serling wished to impart. On the whole, characters often get what they deserve, be it good or bad, and we're left wondering how we might handle these situations ourselves. But without Serling's guidance, these new episodes feel like a procession of strong actors who had nothing to work with, all shot with the same claustrophobic closeups. Bad things happen, then their story simply ends, with no lesson or moral takeaway. The new episodes punish inherently likable characters and strip satisfaction away from the viewer for no real reason, as if to say that life isn't fair. That's a far cry from classic Twilight Zone episodes like The Night of the Meek, A Passage for Trumpet, or The Prime Mover, to name just a few of its more uplifting tales. There's also the well-documented problem of overly long runtimes in the new series, complete with unnecessary breaks for commercials that aren't there. Kudos to CBS All Access for running episodes of varying lengths in this brave new world of streaming services, but they all seem to stretch on way longer than necessary, like an SNL skit that turns stale halfway through the bit. Too often, the audience is arriving at conclusions far earlier than the protagonists, and we're forced to watch them go through the motions - looking bewildered all the while - before they can finally accept the situation unfurling in front of them. That kind of drawn-out format can't hold a candle to the classic shows, which were all lean and no fat in order to fit a 23-ish-minute runtime (except for the fourth season's experiment with 52-minute runtimes). Serling's narration sets the scene, providing all the context you could possibly need to relate, and with that, our protagonists are off to the races. Strange things happen, our heroes react, and the concept is almost immediately pushed further to start the cycle all over again, until finally we reach a satisfying conclusion or a shocking twist. The old episodes are tight and refined, with none of the subplot bloat of the newer stories. Maybe I'm just the kind that sees black-and-white TV through rose-colored glasses, and gets a kick out of performances by actors who enjoyed fame long before my time. But there's such an immutable charm to the original run of The Twilight Zone, making for timeless stories even when the effects look outdated or the ol'-timey dialogue sounds goofy. If you're intrigued by the new Twilight Zone, do yourself a favor and go back to the classics - Netflix has every season at the time of this writing, with the exception of season four. It's there you'll find the true magic of The Twilight Zone: a journey into a wondrous land whose boundaries are that of imagination, no CBS All Access membership necessary. Besides The Twilight Zone, you ought to check out some of the other best Netflix TV shows.